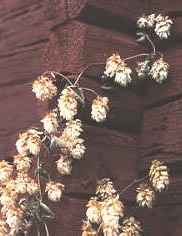 The hop cones have long been used in medicine and as a taste agent for beer. The reason hops started to be used in beer making was not simply for the taste, but because in the old times there were no good methods for preserving beer. Salt was used to conserve fish and meat. All the salty food made people very thirsty but both beer and wine went bad quickly. Thus one began to add bitter plants to make the beer more long-lasting and to delay the souring process. It was probably not just for conservation but also to conceal a bad taste. In the Nordic Countries, it was first mostly sweet gale, wild rosemary and yarrow that were used but, in time, hops entered the picture. The cones of hops have a tranquilising and calming effect and were therefore put into pillowcases. “Hop pillows” were used in field hospitals during the First World War as tranquilisers and sedatives. You can also drink tea made of hops to make you go to sleep more easily. Medical studies have shown that you drop off to sleep more easily and sleep better after taking hop extract. Pharmacies used to sell hop cones, but now they mainly sell hop extracts. The major use of hops is within beer brewing. In 2005, approximately 100 000 tons of hop cones were harvested worldwide. However, picking hops is no easy business since the cones can give rise to allergies. Liquid essential oils are found in the glandular hairs of the female cones’ petals. They contain 15-30 % resins which consist of bitter substances, among others, humulone and lupulone. These bitter substances contribute to the aroma, smell and flavour. It is these that give the hops their mild tranquilising, sedative and antiseptic effect as well as stimulating the appetite and digestion. It has long been known that bitter substances stimulate appetite and digestion which is why we drink aperitifs and bitters. Jägermeister, Enzian, absinth, schnapps, vermouth and Underberg are examples of drinks that increase the stomach’s secretions of acidity and stimulate intestinal movement. More recently it has been discovered that bitter substances can stimulate the immune defence. Beer has a long tradition in the Nordic Countries.